Parent Handbook, Schedules, and Registration . 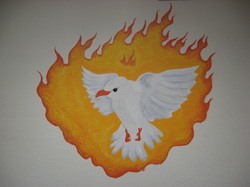 The Christ Our Hope Faith Formation Office began in 2004 as "The Light of Christ". The Light of Christ began when innovative individuals from six local parishes came together, prior to being formally clustered in 2008 as Christ Our Hope, to create a strong religious education and faith formation program that built upon the existing strong school and community identity. These founding parishioners took on the challenge to not simply combine the existing religious education programs, that only served the needs of students, but strived to create a faith formation program, known as Generations of Faith, that meets the needs of parishioners of all ages. The goal then, and now is to help families grow in their faith together and support faith formation at home, as parents are the first and most important catechist and evangelizers in the lives of their children. The COH Faith Formation office serves the parishioners of Assumption of the Blessed Virgin Mary (Little Turkey), Holy Trinity (Protivin), Our Lady of Mt. Carmel (Lawler), St. John Nepomucene (Ft. Atkinson), St. Luke (St. Lucas), and St. Mary (Waucoma). We offer a variety of faith formation programs including Journey with Christ (our primary formation program), Sacramental Preparation, HerStory in Christ, Signs of Christ, Catechesis of the Good Shepard, Adult sessions, Youth Liturgists in every parish to organize local youth masses, and many other opportunities. The COH FFO is guided by a Faith Formation Commission composed of two elected representatives from each parish, the Pastor and the Director of Faith Formation. Like other programs, ours has matured and evolved. In December of 2009 we were blessed to begin utilizing the Fr. Moran center at Our Lady of Mt. Carmel. This facility was specifically built to provide faith formation for the youth. This change allows all students to be taught in a traditional classroom setting by experienced teachers during the grade level sessions. Elementary students meet on Sunday afternoons and 7-12th grade students meet on Wednesdays. HerStory in Christ is a small faith sharing group for high school females. This group was started by students in January of 2017, and Catechesis of the Good Shepard was added for children age 3 through kindergarten in October 2017. In August 2018 the programs and the office underwent some changes. The name "Light of Christ" was confusing to parishioners, so the office is now simply called the Christ Our Hope Faith Formation Office or COH FFO for short. Also, the name "Generations of Faith" no longer was appropriate for the primary program offered by the office. That name is specific to a specific program which we have not really followed for several years. To better emphasize our vision to help all parishioners have on going encounters with Jesus, we changed the name to "Journey with Christ". For adults, we offer a variety of speakers on Sundays at the same time that students have class. We also offer bible studies, book studies, and other opportunities. All parishioners young and old are encouraged to regularly participate in our variety of faith formation programs and service opportunities. Our cluster will host Totus Tuus summer faith camp July 28-August 2, 2019. Below is Fr. Aaron's message to all parents. As we start the 2018 formation year, Fr. Aaron shares his vision for faith formation in the cluster with parents and grandparents in this short 7 1/2 minute video. In his message Fr. Aaron mentions a sheet with information on options for family formation. Please see the document "Faith Formation Electives" to the left for more information. Totus Tuus Pics: Click Here for more pictures. Volunteers at Camp Courageous July 25, 2018.
. 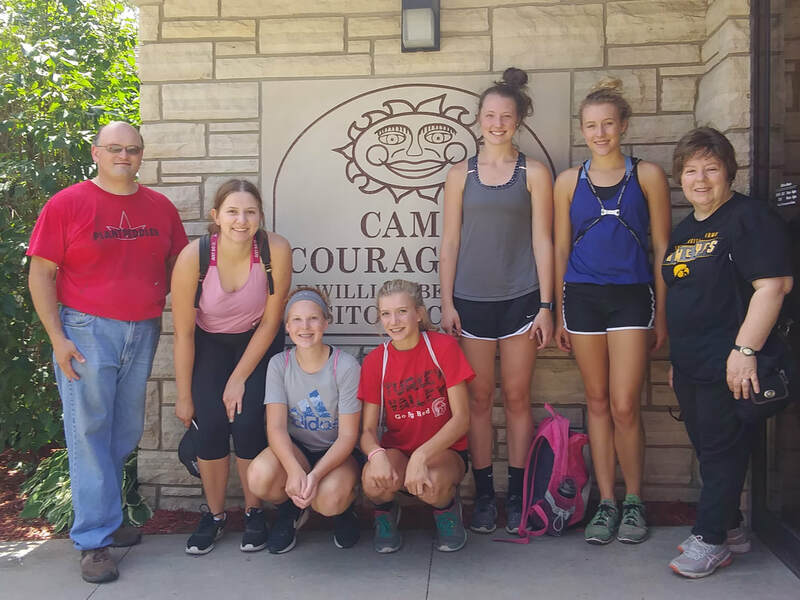 Seven volunteers from the cluster spent the day, July 25th, volunteering at Camp Courageous of Iowa in Monticello. Camp Courageous is a year round camp for individuals with physical and intellectual disabilities. They run completely off of donations and depend on volunteers to help meet their needs. Below, volunteers helped to shuck a pick-up truck load of sweet corn to be frozen to provide meals during the winter. In the afternoon, volunteers helped to clear a 300 yard path through timber to allow the future construction of a property line fence. The Light of Christ is the faith formation program for the six parishes of the Christ Our Hope Cluster. What is Faith Formation? Faith formation is the new and more accurate term for what you might know as religious education or CCD. But we are much more than the program you grew up with. Faith Formation is built on the idea that we are all on a LIFE LONG faith formation journey. Faith formation, learning about God and growing closer to Him and Jesus did not end when you received the Sacrament of Confirmation. Confirmation was just one milestone on that journey. The Light of Christ offers faith formation for everyone, including adults. So come and learn more about our main program, Generations of Faith, and we look forward to having you join us in the near future.